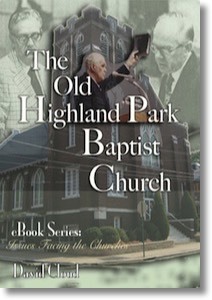 This book examines the fall of Highland Park Baptist Church of Chattanooga, Tennessee, from its “old” days as a “fundamentalist” institution to its new incarnation as a contemporary rock & roll center. The author was a student at Highland Park’s Tennessee Temple Bible School in the 1970s and has witnessed the dramatic change. We are convinced that there was “death in the pot” even then and offer the following reasons why the institution fell: soft separatism, a philosophy of positivism, the practice of “independent Baptist unityism,” the principle of not allowing “criticism,” biblical shallowness, bigism and pragmatism, Quick Prayerism, modern textual criticism, scholarolatry, and the refusal to speak out clearly against compromise and error. The same principles are leavening a large number of other independent Baptist churches today and the result will doubtless be the same.